Build up your liquid cooling system with the newest series of Thermaltake case line – The View 27 Gull-Wing Window Mid-Tower chassis. Unlike any other cases that come with a transparent panel on the market, the gull-wing window design allows users to fully display their system whilst keeping the interior dust free. With support for the latest PC hardware, AIO and DIY liquid cooling solutions, the View 27 is perfectly made either for entry-level users or for PC enthusiasts. Thermaltake PCI-e X16 Riser Cable (Optional) – Support a wide range of GPU solutions and match the cable included in the View 27 or other chassis. The View 27 has the capability to deliver an outstanding cooling efficiency throughout the entire case. At the front of the case, users can install up to either 360mm DIY liquid cooling radiator, or 360mm AIO liquid cooler, with a long graphic card at the same time. Additionally, a 120mm exhaust fan is preinstalled at the rear to optimize system ventilation. To keep the interior dust free, all intake ventilation holes are specially designed with removable dust filters. Features • Specially desgned with a gull-wing style side window to full display your system's interior while keeping it dust-free. • Graphics card can be installed either conventionally or front-facing. • Tool-free drive bay design. • Bottom cover area to hide the power supply and unwanted extra cables for a tidy looking system. • Supports a CPU cooler height of up to 155mm, graphics card length up to 410mm without the front fan installed. 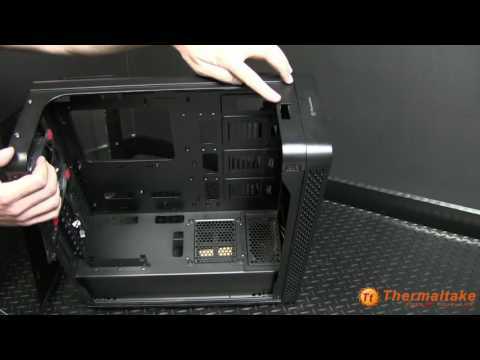 ThermalTake View 27 Mid Tower Computer Chassis, ATX/Micro ATX/Mini ITX, Black, Gull-Wing Side Window, 120mm Fan, USB3.0 is rated 5.0 out of 5 by 2. Rated 5 out of 5 by Phil599 from Decent quality at a very good price I bought this for my first PC build as I had read that it has good cable management and decent cooling. It is surprisingly well made, given that it is cheaper than most cases. I think I'd rather a case with no viewing window in future, but that's personal preference so I can't really complain. Rated 5 out of 5 by JeffFromStalingrad from Brilliant I love the case, the standard fan is a bit loud but a replacement and all good. Great airflow for only a 120mm exhaust and up to 360mm intake. 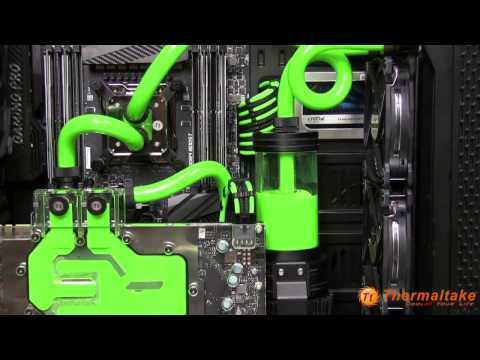 ( I have a 240mm fan installed at the front. Easy to use and looks so good. Recommended GPU Fan or Blower Founders Version? Hi Chad Probably a little late here but I have one of these cases. Normally I would say get a GPU with an aferrmarket cooler as they are generally more efficient. In this instance though I'd recommend a blower cooler, and the case is actually set up to feed a blower cooler. As it has a grilled area on the PSU shroud where you can fit a 120mm fan to blow cooler air from below straight at the GPU fan, which can then exhaust the hot air from the GPU out of the back of the case. As this case has no other exhaust apart from a rear 120mm fan. No roof vents obviously, so it can get warmer than conventional cases in there. From memory it came with just one. I ended up putting 3x noctua fans which look odd (beige and brown) but seem to be doing the job just fine.